I've posted a Beta test version of the latest changes to AWC. The most obvious change is to the Preferences screen. It's intended to be less cluttered, more user friendly and allow more explanatory text to be displayed. This version can be downloaded from: http://awc.smurphy.co.uk/AWCBeta.exe. I've not updated the installation program to reflect the version number changes yet so don't worry that the informational text is the same as for the previous version. There are a few screen shots at the bottom of this post. Function of Save button changed so that it still saves the current preferences as the default if no theme is currently selected but saves any changes to a loaded theme to the theme NOT as the default. The Save settings on exit option has change to Save settings on exit or when loading a new theme. Currently selected theme is displayed in status bar. Theme menu is available by right-clicking on the theme name in the status bar. 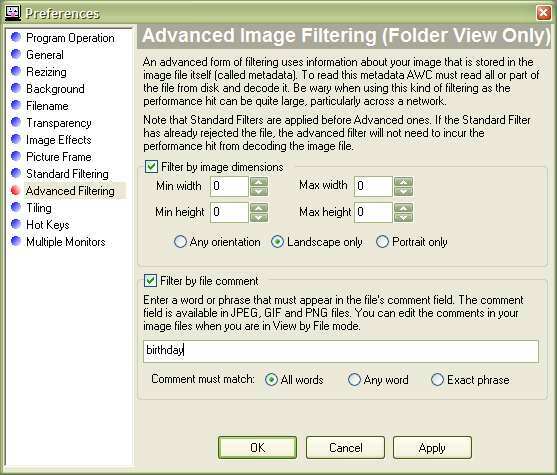 Some of the help text on the preferences screen contains a link to a web page containing example of how the option will affect your picture display or to more extensive help. The availability of such a link is indicated by the mouse cursor changing to show a small question mark. Just click the item to open the link in your default browser. (1) have the File Name of the currently displayed image automatically visible in the main window so one does not have to search for it. In fact if the image name is not displayed on the screen, scrolling through 2,000 file names can be time consuming even though the current image name is highlighted. I thought you sort of liked this idea? (2) transitions between images (especially fades). I am pondering if a true fade feature would help prevent the "jumping" effect I still obseve. In 4.9 the "jumping" is even more pronounced in some overlayed programs than in 4.8. Remember in my original post I observed: "I like to keep the changer set to about 30 seconds continuously however if working full screen in another program each image change causes a "blink" (now a "jump") which can be annoying so I end up pausing the changer." I believe you replied that this is inherent in some programs, but why not in all? I have noticed it even causes the task bar to "jump" in Vista. The other program I use extensively that is now almost unuseable with the 4.9 running is Thumbsplus. Thoughts? My third request for a "refresh button to add images recently added to the folder seems no longer needed as my tests show that even in a subfolder newly added pics are now picked up.